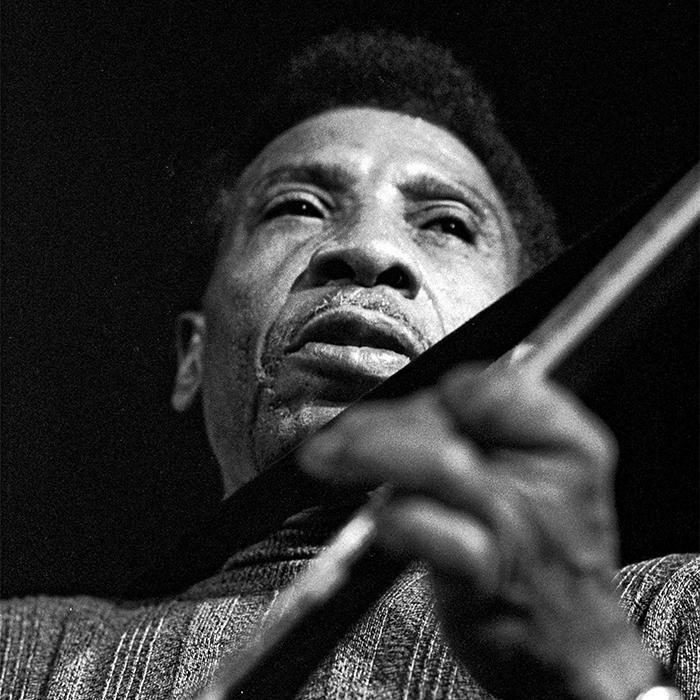 T-Bone Walker (Aaron Thibeaux Walker, May 28, 1910, Linden, Texas — March 16, 1975, Los Angeles, California) was an American blues guitarist, singer, pianist and songwriter who was one of the most important pioneers of the electric guitar. Walker was born in Linden, Texas of African and Cherokee descent. Walker’s parents, Movelia Jimerson and Rance Walker, were both musicians. His stepfather, Marco Washington, taught him to play the guitar, ukulele, banjo, violin, mandolin, and piano. Early in the 1920s, the teenage Walker learned his craft among the street-strolling string bands of Dallas. His mother and stepfather (a member of the Dallas String Band) were musicians, and family friend Blind Lemon Jefferson sometimes joined the family for dinner. Walker left school at age 10, and by 15, he was a professional performer on the blues circuit. Initially, he was Jefferson’s protégé and would guide him around town for his gigs. In 1929, Walker made his recording debut with a single for Columbia Records, “Wichita Falls Blues”/”Trinity River Blues,” billed as Oak Cliff T-Bone. Oak Cliff was the community he lived in at the time and T-Bone a corruption of his middle name. Pianist Douglas Fernell was his musical partner for the record. Walker married Vida Lee in 1935 and the couple had three children. By the age of 26 Walker was working the clubs in Los Angeles’ Central Avenue, sometimes as the featured singer and guitarist with Les Hite’s orchestra. His distinctive sound developed in 1942 when Walker recorded “Mean Old World” for Capitol Records. Much of his output was recorded from 1946–1948 on Black & White Records, including 1947’s “Call It Stormy Monday (But Tuesday Is Just As Bad)”, with its famous opening line, “They call it stormy Monday, but Tuesday’s just as bad”. He followed up with his “T-Bone Shuffle” and “Let Your Hair Down, Baby, Let’s Have a Natural Ball”. Both are considered blues classics. Following his work with Black & White, he recorded from 1950-54 for Imperial Records (backed by Dave Bartholomew). Walker’s only record in the next five years was T-Bone Blues, recorded over three widely separated sessions in 1955, 1956 and 1959, and finally released by Atlantic Records in 1960. By the early 1960s, Walker’s career had slowed down, in spite of a hyped appearance at the American Folk Blues Festival in 1962 with Memphis Slim and Willie Dixon, among others. A few critically acclaimed albums followed, such as I Want a Little Girl. Walker recorded in his last years, 1968 - 1975, for Robin Hemingway’s Jitney Jane Songs music publishing company, and he won a Grammy Award in 1971 for Good Feelin’ (Polydor), produced by Robin Hemingway. “Fly Walker Airlines”, Polydor, also produced by Hemingway, was released in 1973. Walker’s influence extended beyond his music. Chuck Berry called Walker and Louis Jordan (as well as Jordan’s guitarist, Carl Hogan) his main influences. T-Bone Walker was the childhood hero of Jimi Hendrix, and Hendrix imitated some of Walker’s ways throughout his life. Years before Hendrix, Walker was playing guitar with his teeth or in strange positions.